Photos courtesy of Tribe Alive. The sustainable lifestyle brand’s new digs will be a place of education. Carly Burson was with her husband in Ethiopia, finalizing the adoption of their daughter, when the idea for Tribe Alive began to take root in the back of her mind. She had spent a significant amount of time at an Ethiopian orphanage, where she came into contact with many mothers who didn’t have the means to support their children, and had been forced to give them up. “I wanted to give women the opportunity to raise their own children,” says Burson. So Burson, who prior career included designing and merchandising for J. Crew and Anne Taylor, got to work establishing relationships with female artisans in Honduras and Guatemala. Steadily, with the support of different communities across the globe, Tribe Alive flourished from Burson’s dream of honoring her daughter’s birth mother to a company that empowers women around the world. Now, four years later, the reach of Tribe Alive’s work stretches to Haiti, India, Uganda, Gana, Ecuador, and Fort Worth, Texas. The woman in these different countries make clothing, handbags, necklaces, and a variety of other items by hand. Millions of people all over the world make our clothes and too many of them live in extreme poverty, work in dangerous conditions, and face daily exploitation. Join us and the #FashionRevolution and demand a fair, safe and more transparent industry. Ask brands #whomademyclothes all week long and help us move the industry toward a more humane approach. And Tribe Alive continues to grow. Last week, the company hosted a party for their first retail space located on Fort Worth’s Magnolia Avenue. Brick and mortar wasn’t in Burson’s original plan for the brand, but she and the rest of the team, including senior designer Katie Samson, have witnessed over the last three years how much the Tribe Alive story resonates with people. 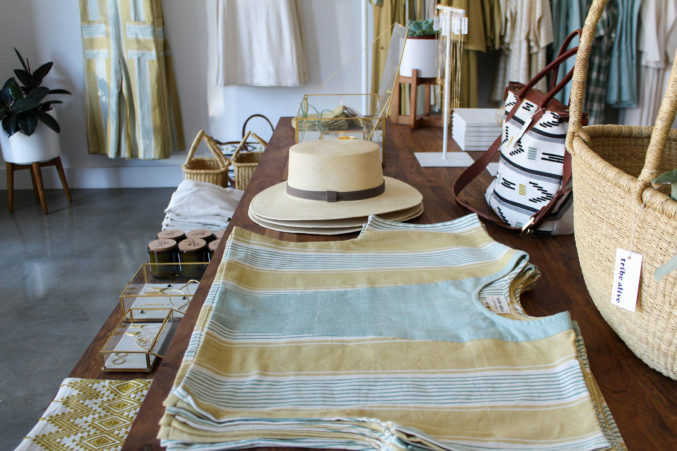 This store allows Burson and Samson to educate shoppers about ethical fashion. “It’s really exciting to see how people react to the product even before they react to the story,” says Sansom. The front half of the shop will be a showroom where customers can look at the creations and touch the intricate designs of the dresses and bags and jewelry made by women in Haiti and Honduras and Fort Worth. The back half — the design studio — invites shoppers to see where the magic takes place. Additionally, Burson and Sansom hope to host events in the shop, such as yoga, watercolor classes, or succulent arranging socials — anything that brings women together to talk, to create, to lift one another up and imagine. Fittingly, the brand the celebrates motherhood and womanhood, celebrated its grand opening on Mother’s Day weekend.